Our commitment to service is the cornerstone to our success. We are proud of our history and often reflect on our service record that not only put us on the map, but has kept us there for over sixty five years. With a number of second and even third generation customers, it’s very rewarding to reflect back on the friendships and relationships that we’ve developed over the years through maintaining people’s boats. With a full time staff of three factory trained technicians, we are well equipped to handle most facets of marine repair on outboard and stern drive powered pleasure boats up to about 30′. 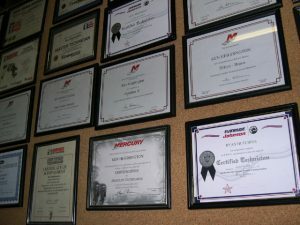 Our three certified marine mechanics collectively have logged over 25 years on the job at Proctor Marine. These technicians are well respected in the marine industry and two of our senior technicians have achieved the highest level of service training available from both Mercury Marine and BRP Evinrude. We are proud of a staff turnover rate amongst our service staff that approaches zero. In the last 25 years only one technician has left our service department for any reason other than retirement. We maintain a well stocked parts department to keep repair time to a minimum and our Parts & Service Manager is a partner in the company. Our aggressive buying power allows us to offer lower prices on many consumable items such as oils and lubricants. Our parts counter team knows their stuff. Whether you are looking for service parts for your Evinrude or Johnson outboard or a Mercury or Mercruiser product, chances are we could have it in stock. If not, we can order it promptly and accurately for pick up in a few short days. We invest in quality equipment to handle your boat professionally and reliably. Our overhead hoist is capable of handling vessels to 10 tons. Our inventory of special tools is more complete than most of our peers in the trade. We keep our technology assets up to date as well, using modern laptops with the latest diagnostic software allowing us to stay on top of updates and enhancements when maintaining modern engines. 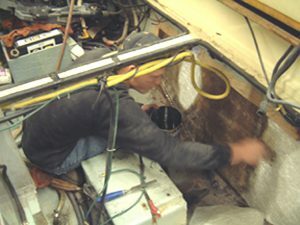 It is reassuring to know that your boat is being handled with care by trained pros using proper equipment. 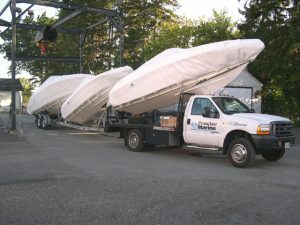 Many c ustomers drop their boats off with us each October, and don’t see their pride and joy until they pick it up in our yard the following spring. It’s hard to put a price tag on this kind of peace of mind. If you enjoy “do it yourself” projects and maintain your own marine equipment, you might find it handy to have access to the same exploded parts diagrams that our technicians and parts counter staff use right here at the dealership.